LaRod Stephens-Howling returned the opening kick-off 102 yards for a touchdown, staking the Cardinals to an early 7-0 lead en route to a dramatic 24-23 victory after Janikowski's game ending 32-yard missed field goal. Derek Anderson – 12/26, 122 yards, 2 TDs, 1 INT. Anderson continues to struggle, especially with accuracy. He completed only 46% of his passes, which just won’t cut it in the NFL. Anderson needs to get his completion percentage up around 58%, which is about the standard mark for good quarterback play. In addition to his poor accuracy, Anderson missed a wide open Larry Fitzgerald not once, but twice. Both would have been easy touchdowns as Fitz streaked down the field completely uncovered by the Raiders’ defense. Further, Derek Anderson’s intercepted shovel pass was a terrible decision, especially since the Cards had just picked off Gradkowski and were moving down the field to take points off a turnover. At some point, the Cardinals aren’t going to be able to come up with special teams touchdowns and game saving strips. Derek Anderson is going to have to put together a few solid games for this team to make the playoffs. It’s unclear whether Anderson is going to be able to get himself together. If he doesn’t, all the Cardinals have left is rookie Max Hall. Beanie Wells – 75 yards, 14 carries, 5.4 average. Wells, who apparently had unannounced arthroscopic surgery to repair a torn meniscus in his knee two weeks ago, looked very sharp in his first taste of regular season action. Wells’ power and speed were both on display as he sprinted, stiff armed, and barreled his way to 75 yards on only 14 touches. Wells even managed to hurdle clear over a couple of would be tacklers at two different points in the game. If Wells can give this effort week in and week out from here on, the Cardinals offense will definitely improve. Steve Breaston – 4 receptions, 41 yards, 1 TD. Breaston turned in a gutsy performance considering he’s still obviously feeling the effects of his knee injury. Although he wasn’t a consistent factor in the game, he came up big with his much needed touchdown reception. Ben Patrick – 2 receptions, 29 yards. The big tight end’s numbers don’t jump out by any means, but he’s starting to get more targets. 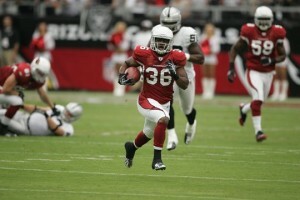 In this game, the Cardinals target him twice and Patrick came down with two receptions. The first was on a seam route up the left side of the field after Anderson ran a quick play-action with Hightower. It was a quick, decisive strike, which was very well executed all around. The second was another play-action, but this time Anderson rolled out and hit Patrick on a drag route. Considering Anderson’s accuracy problems down the field, the Cardinals should look to take advantage of their tight end for quick strikes like these. Don’t give Anderson any time to think about missing the mark; get it, throw it. A pass catching tight end is an offensive dimension that has been missing from the Cards’ offense for many, many years. Levi Brown, Alan Faneca – Both LT Brown and LG Faneca were once again equally terrible. Both let up a sack and plenty of quarterback pressures. In addition, Faneca, for the second week in a row was manhandled by a better, stronger, and faster DT. This time it was Richard Seymour, who consistently stood Faneca up and almost effortlessly tossed him out of the way like a minor nuisance. Levi Brown, unfortunately, continued his lead footed pass protection as he was barely able to put a hand on Shaugnessy before the DE obliterated Anderson. Finally, Lutui was embarrassed on one, allowing his man to tackle Beanie Wells for a two yard loss, but Deuce redeemed himself on a critical 4th down, acting as a road grader allowing Wells to pick up the first down right behind him. As for Brown and Faneca, something has to give because they have played very, very poorly in all three games this season. Brandon Keith – The Cardinals right tackle continues to be a pleasant surprise. He’s not going to end up in the Pro Bowl by any stretch, but in his first year as a starter Keith is making improvements every week. He’s already light years ahead of veteran Levi Brown in pass protection and he’s showing that he can be a valuable asset in run blocking as well. Keith has the athleticism to pull, which can be useful in springing Hightower and Wells around the outside. The Raiders’ offense did compile a distressing amount of yardage (364 total yards), but the Cardinals were exceedingly stingy were it counted most, the redzone. In five trips to Arizona’s redzone, the Raiders only cashed in with one touchdown, which came on a Darren McFadden run with ten seconds left in the first half. Although the Cardinals’ defense basically spent 90% of the second half on the field, they only gave up 3 points, despite the fact that Arizona staked Oakland with one of the Cardinals’ three turnovers in the second half. Kerry Rhodes – 8 tackles, 2 assists, 2 batted passes. Rhodes turned in his second very nice effort in three games this season. After a terrible showing last week against Atlanta, Rhodes rebounded against Oakland by flying all over the field, making a number of tackles. Rhodes also batted a Gradkowski pass in the air, which was subsequently intercepted by Paris Lenon. In addition, Rhodes defended a pass in the endzone by batting it harmlessly to the ground. If Rhodes continues to make plays like these, the Cardinals will not miss Rolle’s playmaking ability, especially considering Rhodes is without question a much, much better cover guy. Paris Lenon – 7 tackles, 1 assist, 1 sack, 1 INT. Lenon, without question, had his best game as a Cardinal. He made a fine number of tackles, dropped Gradkowski on a key third down, and snatched a batted pass out of the air for his first interception of the season. The Cardinals hadn’t really counted on Lenon being a playmaker, but if he can keep this effort up it would go a long way in shoring up the Cardinals’ defense. Darnell Dockett – 6 tackles, 1 sack. Like Rhodes, Dockett bounced back after a disappointing game in Atlanta. Darnell grabbed his first sack of the season and was constantly causing problems for the Raiders up front, especially in the second half. I’m not sure if there’s a faster DT off the ball anywhere in the NFL; he’s like a lightening strike when the ball is snapped. Joey Porter – 4 tackles, 1 sack, 1 forced fumble. Like Lenon, Porter had his best game as a Cardinal, forcing his second fumble in two weeks. The senior linebacker also grabbed his first sack of the year. Although Porter got to the quarterback once, he tends to disappear in the majority of pass rush situations and he also has some trouble getting off blocks. On more than one occasion yesterday, Porter could be seen reaching an arm out at McFadden as he was being swallowed by an offensive lineman. Greg Toler – 3 tackles. Toler earned his paycheck this week in the fourth quarter, when the Raiders targeted him in the redzone three times on four plays. Although Toler gave up a pass interference call on the first for barreling into Darrius Heyward-Bey on a 3rd and 12, Toler’s coverage stood up on the Raiders’ final two attempts to pick on Toler. The first year starter has certainly had his less than splendid moments, but he came up huge yesterday and, besides Janikowski, is one of the primary reasons why the Cardinals came out with a win. Adrian Wilson – 5 tackles. The senior Cardinal didn’t have a particularly good game. He single-handedly gave up one of the Raiders two touchdowns by completely losing track of Raiders’ tight end Zach Miller on a 22-yard touchdown strike from Gradkowski. Wilson blew his coverage on a few other plays, as Miller compiled 4 receptions for 64 yards. Miller, however, is one of the premier pass catching tight ends and considering Wilson’s immeasurable value to this team as a playmaker and leader, I think we can let this game slide. This unit accounted for so much this game, good and bad. Aside from Stephens-Howling’s opening kickoff return for a touchdown, the unit constantly put the Cardinals behind the eight-ball. Twice in one game, the punt return team muffed it, giving the ball back to the Raiders. The two turnovers led to a combined 6 points for Oakland. The first muff occurred when the punt bounced and hit Matt Ware, who was streaking down the sideline to block for return man Andre Roberts. The second occurred in similar fashion, but this time it was DRC who ran directly into the punt, which glanced off DRC’s knee. The Raiders of course jumped on both loose balls. The Cardinals desperately need to find someone to return punts that isn’t Steve Breaston. Aside from the two turnovers, Andre Roberts was terrible on the punts he actually got his hands on. He only managed a combined 6 yards on two returns. In addition, Roberts fielded a punt inside the 5 yard-line, turned in a circle and was dropped right were he started. I would love to ask Roberts what he was thinking when he caught that ball five yards from his own endzone instead of letting it bounce. Further, the argument can be made that Roberts, as the return man, should have alerted Ware and DRC of their proximity to the ball on the two muffed punts, which apparently Roberts did not do. Finally, it’s debatable whether Roberts could have ran up on the punts and called for a fair catch instead of letting the ball hit the turf or another player. In any event, the Cardinals need to solve their punt return problems quickly. The only reported injury was Paris Lenon, who bruised his tail bone, but returned to the game. He isn’t expected to miss any time. Raiders’ kicker Sebastian Janikowski had a career 90.3% success rate on field goals from 30 -39 yards. Before yesterday, he had not missed a field goal from 32 yards or closer since missing from 29 yards on December 3, 2006 in Houston. Janikowski hit his last 19 attempts between 30 – 39 yards. Next week, the Cardinals take on the Chargers (1-2) in San Diego, who just lost in Seattle to the Seahawks (2-1).